In addition to week-long and weekend mission trips, Operation Renewed Hope operates 1-day medical mission trips within the United States. Operation Renewed Hope 1-day medical clinics are sponsored by a local church and administered in the community where the church serves. 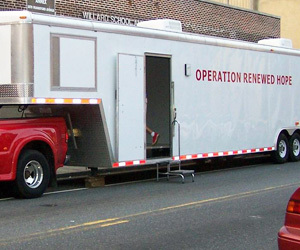 Operation Renewed Hope owns and operates a tow behind large medical trailer that provides mobile medical assistance and relief wherever it is needed within the United States. In order to cover the costs of these one day mission trips, the sponsoring church must provide $500, plus ask for a love offering to help cover the total $1500 expense for the operations of the trailer and supplies. Please contact Operation Renewed Hope for more information about 1-Day Medical Missions. This trailer is clinic on wheels and through ORH supplied doctors and assistance from volunteers from the sponsoring church, provides general practice, lab work and optional optometry and dentistry. Patients are seen by the ORH doctors and either assisted in their medical needs in the trailer or referred to a local physician for more extensive medial care. Patients will hear the message of salvation through Jesus Christ and will be invited to attend the sponsoring church for community fellowship and continued learning about Christ. Keep up to date with missions, news and more by signing up to receive the ORH Newsletter. Operation Renewed Hope is a Christ-centered nonprofit medical missions and disaster relief agency providing relief at home and abroad to those in need. Air Hope is a division of Operation Renewed Hope that specializes in short term, fly-in missions to Latin America and the Caribbean. Copyright © Operation Renewed Hope 2017. All rights reserved.